Luther on the Jews (Sasse) + Martin Luther über die Juden: Weg mit ihnen! 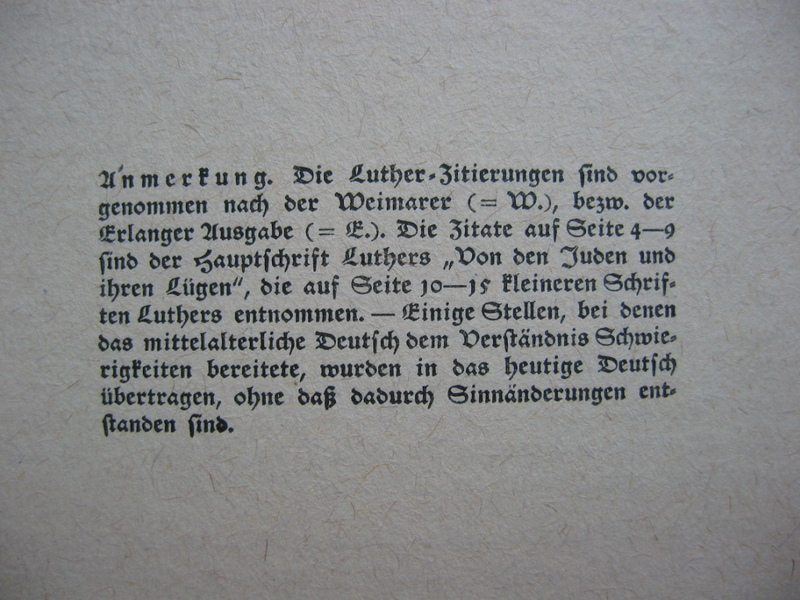 On November 10, 1938, on Luther’s birthday, the synagogues of Germany burned. In the new Germany, in atonement for the murder of our diplomat von Rath by Jewish hands, Jewish economic power over the German people was permanently broken, and so crowned the God-blessed fight of the Führer for the total liberation of our people. The voices of world Catholicism and Oxford world Protestantism rise together with the western democracies, as the Jews’ patrons, against the Third Reich’s opposition to the Jews. In these hours, the voice of a 16th century German prophet needs to be heard, a man who out of ignorance began as a friend of the Jews, but driven by his conscience, his experience, and reality, became the greatest antisemite of his time, to warn his people against the Jews. This publication is intended to let Luther speak to us in his own words. His voice is still more powerful than the paltry religious writings of popular foreign converts and international scribes, who know nothing of Luther’s work and will.